Swiss cottage tents are portable shelters used in temporary public gatherings and are widely used for camping and trekking. We manufacture a wide array of Swiss cottage tents which are made from high quality raw material and are known for their beautiful colour combinations, lightweight, water resistance, optimum tensile strength, portability and low maintenance. These tents are highly acclaimed for distinctive attributes such as water resistance and ability to with stand extreme weather condition and are available in various, sizes, patterns and shapes. This elegantly designed Stylish Swiss Cottage Tent leave a great impression of its attractive style to anyone who enjoys a stay under its roof. 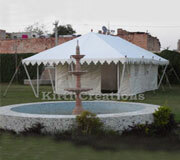 Domed shaped with beautiful design all over it signifies its immense magnificence.